Quit counting out your tokens by hand! Save time, money and reduce overhead and pilferage in one simple move. Purchase a TokenTech #2000, plug it in, fill it up and start dispensing tokens. No more wasted time spent counting out tokens by hand or rolling them. An estimated 97 percent of all Token Techs ever sold are still in use today. Five out of six Token Tech first-time customers have ordered additional Token Tech dispensers. Perfect for FECs, arcades and game rooms and amusement centers, it’s great for birthday parties, promos and coupons—any token transaction not appropriate for a bill changer. 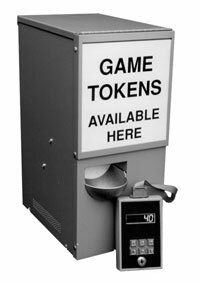 The Token Tech #2000 can dispense tokens up to 1.125” and can be used with a wide range of tokens (not suitable for plastic or wooden tokens). It features a pre-dispense LED display, with an automatic error re-set control button. It is a two-key, double-lock system with a non-resettable counter. Vended token readings (totals) can be taken on a daily, hourly, or work shift basis. Prices are FOB Cincinnati, OH, USA.